Can the laptop-like tablet beat the iPad Pro? Something to look forward to: Samsung's today unveiled their upcoming Galaxy Tab S4 tablet. The device's main claim to fame is a software mode called "Dex" that turns the S4's interface into a desktop-like version of Android, giving users the ability to drag, resize, or minimize app windows at will. Ahead of its upcoming Galaxy Note 9 event in Brooklyn, New York, Samsung unveiled its Galaxy Tab S4. The Tab S4 is a 10.5-inch tablet with a crisp 2560x1600p display, sleek bezels, and a distinct lack of a physical home button. However, if you thought this was merely going to be another ordinary Android tablet, think again. 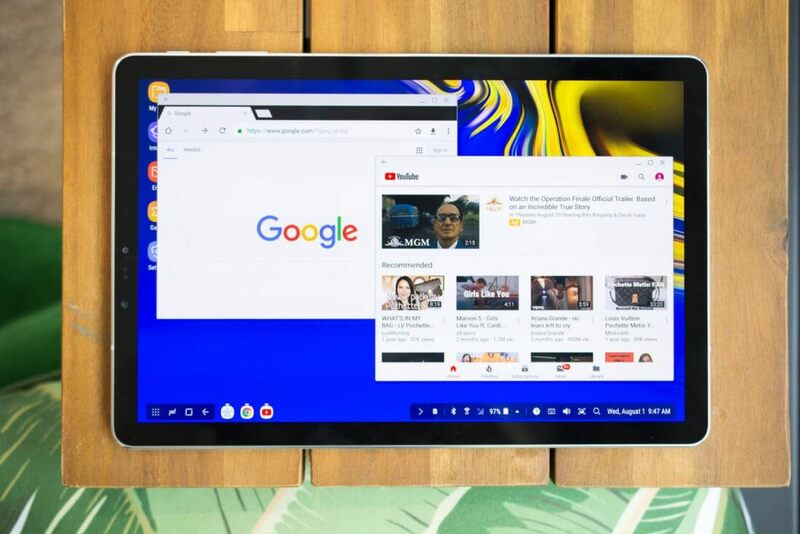 Alongside the standard mobile-like Android experience, Samsung's Tab S4 also offers "Dex," which can effectively transform the tablet into a touchscreen laptop. To be clear, the device still runs Android in Dex mode. However, users are able to drag, minimize, resize, and close app windows, or access a desktop-like taskbar towards the bottom of the screen. For an even more laptop-like experience, you can attach a keyboard to the Tab S4, though it will be sold separately. The desktop-like interface looks pretty solid based on the images we've seen so far. Dex's primary goal seems to be making multitasking more natural than ever - Samsung claims the mode can handle up to 20 open windows at once. Furthermore, Dex also features the split-screen option you'd typically see in a Windows machine. It should be noted that the apps you run via Dex are still Android apps, and as such, they won't all be optimized for desktop viewing. It will be possible to use them all in Dex, of course, but how pleasant your experience will be is another story. From a hardware perspective, the Tab S4 boasts 4GB of memory, 64GB of storage, a speedy Snapdragon 835 mobile processor, and a 13-megapixel rear camera. The device also ships with its own stylus and a 7,300mAh battery, which can reportedly run the device for around 16 hours of video playback. If the Galaxy Tab S4 sounds like your cup of tea, you'll have to wait a bit longer to take it for a test drive. The device launches on August 10 at $649, but pre-orders don't seem to be available for the time being.